It’s the music of the spheres. Or at least, the music of the various, floating geometric shapes, bouncing around a virtual galaxy with gravity simulation. 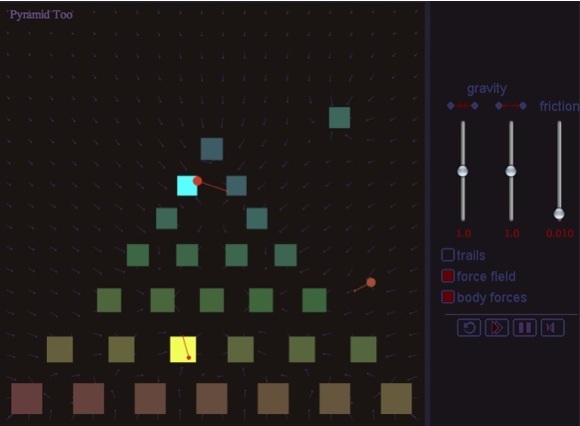 Kepler’s Orrery is a (newly) open-sourced generative music maker, based on a gravity simulation algorithm. As bodies collide, they make sound; it’s a bit like what would happen if you crossed a music box with a snow globe. Different worlds represent different songs. You can reach in and grab some of the objects, so it’s possible to “perform” with the project. The application runs directly in a web browser (assuming your Java is up to date), and since it’s open source, digging around in the code could inspire your own Java-based musical environment. And yes, there are some similarities here to the generative music of Brian Eno (soon to be heard in the upcoming Will Wright game Spore) and sound artist/composer Toshio Iwai’s ElectroPlankton game. Perhaps we have a whole genre of musical creation in the works here.